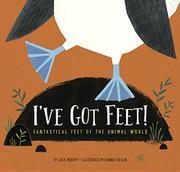 A gamboling gallery of animal feet in action. Tolson’s cheery paint-and–cut-paper views of smiling animals on the move carry a light but, considering the thundering herd of similar surveys available, unexceptional load. They illustrate a survey of how animal feet are adapted to run, jump, climb, swim, dig, grip, kick, keep eggs warm, and—in the case of the male blue-footed booby—attract the ladies. Readers will come away with a solid grasp of the notion that there are different sorts of feet, but it’s misleading to claim that “CHEETAH feet never slip,” and as Murphy sticks to vertebrates for her 13 examples, the “feet” of snails and insects go unnoted. Moreover, she skips past adaptive differences in bone structure or other internal anatomy, nor does she offer print or online leads for young investigators who might want a leg up on, for instance, the three basic types of mammalian foot.